Hinduism is perhaps the oldest religion in the world, with sacred texts estimated to date back to 3000 B.C. Many of its traditions have lasted for eons, with origins lost in time. A Hindu wedding, one of the most sacred of rites, incorporates many of these timeless rituals and customs. 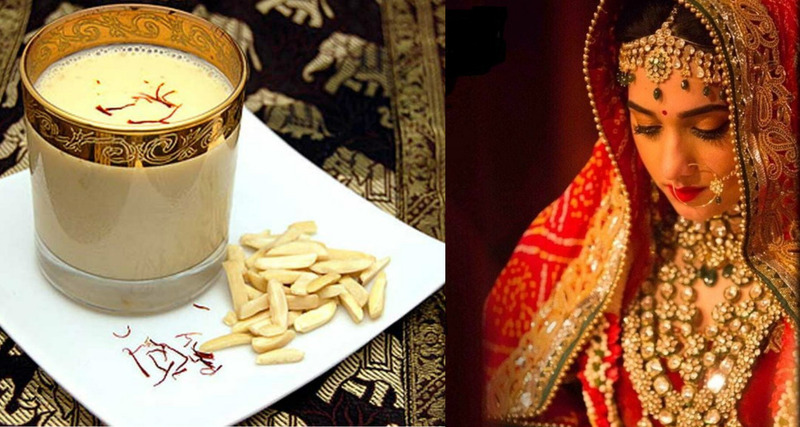 And one such tradition is that of serving the newly-weds (specifically the groom) with a glass of milk on their wedding night. Needless to mention but this tradition is extremely popular, courtesy Bollywood movies and TV serials. Amino acids, the building blocks of protein, are the substances that give you a shot of strength, which is why you are recommended a protein shake before a workout. That may explain why it is a practice to leave a glass of milk and a plate of almonds in a couple’s wedding night chamber. Think of this chain reaction: milk and almonds both give you protein; protein is needed for making hormones (testosterone and oestrogen) and these two hormones means better s*x. According to Ayurveda, milk is considered an important part of the diet. Milk is a good vrishya (aphrodisiac), which means it strengthens the shukra dhatu (reproductive tissue). Milk is cooling in nature, which means it has a cooling effect on the body. Among the eight types of milk mentioned in Ayurveda, cow’s milk is said to be the best. Cow’s milk is rejuvenating and strengthens the various tissues, improves memory, and boosts immunity. It is easily digested and absorbed in the body that’s why it is served at night. It nourishes all tissues right down to the Ojas, the most subtle essence of our body/mind. Milk is nourishing, cooling, balancing to Vata and Pitta, and is a great medium to take herbs with. Despite the controversy surrounding milk in our time, Ayurveda teaches that cow’s milk is the most satvic and nourishing of foods, a natural food for all humans. It is an aphrodisiac and vitalizing to reproductivity so that both your s*x drive and your offspring are strong. Texts of ayurveda have recommended many simple milk recipes for men to increase their ability to be s*xually active. There are many herbs like kesar, shilajit etc that are added to milk to make it more beneficial. Milk acts as a vehicle and helps these herbs to reach tissues of male reproductive system. Thus the total male reproductive system gets rejuvenated and doshas get balanced. Regular consumption of such preparations also help men to get young looks and stay healthy. It increases libido, low sperm count and motility. Rehydration Fluids are an integral part of the human body, and the body needs to be frequently replenished with liquids as they are used up within the body. Healthy people drink at least six to eight glasses of fluid every day. Milk contains a good quantity of water molecules and is considered the best fluid for rehydration, outside of drinking actual water. Water makes up more than 80% of our body mass, and the balance of fluids in our body is essential for every single process in our body. As children, we often drink milk before bed. Basically milk helps repair the body when we sleep as the protein in milk helps muscle growth and improve the condition of exhaustion. Women have the potential for high stress with solid activity and risk of osteoporosis due to lack of exercise and the body’s biological processes. Milk has also been proven to reduce symptoms of PMS in women and boost energy. It’s a great way to de-stress at the end of the day after all the tiring wedding rituals. Fresh milk provides carbohydrates to your diet in the form of sugars, the bulk of which is lactose. Your body prefers carbohydrates as its energy source because all your cells can readily use it without the need for prior processing, as can be the case with fats and proteins. Additionally, your brain and kidneys require sugars to function properly. A 1-cup serving of fresh milk contributes 12 grams of sugar to your diet. Almond milk strengthens the body. It is rejuvenating, an aphrodisiac and a good tonic for the nerves. It enhances intelligence, memory and the ability to understand things quickly. This is a very good restorative, especially in autumns and winters, or after a period of major exertion. Milk is a very good antacid! Drinking a glass of milk when you experience heartburn can calm your food pipe from inflammation. Drinking milk regularly will prevent heartburn and other gastric problems. Milk can be a good appetizer, especially when you are dining late. Drinking milk can also act as a stimulant, early morning or even during noon.